The fulcrum for this hour-long Braga Santos collection is the Piano Concerto. Even that work represents an unusually compact experience at not much more than quarter of an hour duration. 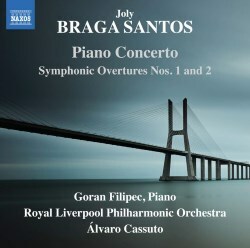 The Portuguese composer Joly Braga Santos was very much a Lisbon man and his Second Symphonic Overture bears the name of his city of birth and death. His music evinces a sharply marked bifurcation in style. He wrote his first four of six symphonies between 1946 and 1950, adopting a language freshly re-imagined from his teacher Luís de Freitas Branco whose four symphonies are on Naxos (8.570765, 8.572059, 8.572370, 8.572624) conducted by Alvaro Cassuto This straight-talking, dramatic, poetic and folk-enriched approach makes those first symphonies an easy conquest for those who enjoy their Bax, Holst and Moeran. You can hear this most clearly in the Lisboa overture - for example at 4.10. This joyous, uncomplicated yet satisfying approach prevailed with Braga Santos until his sojourn in Italy. After that a more angular, thorny and brittle - and some would say obtuse - style prevailed. He returned to the symphony after a dozen or so years with the two forbidding examples to bring his symphonic complement to six. Those last two are quite different in language from the first four and on first hearing took me by the scruff of the neck and shook me. There's an equivalence in listening to late Bridge after hearing the works that predated the Great War. This disc mops up various 'straggler' works in splendid style. There are three Symphonic Overtures and this collection delivers up the first two from his first period. The third Symphonic Overture can be heard on another Naxos Braga Santos disc (8.572815). The first Symphonic Overture, which is half the length of the second, is his first work for orchestra. They amount to an amalgam which is a rough and ready match for RVW's In the Fen Country, Howard Ferguson's Overture for an Occasion and Moeran's In the Mountain Country, Overture to a Masque and first two Rhapsodies. Slightly more psychologically sombre is the Viver ou Morrer (To Live or to Die) Prelude which derives its inspiration from a radiophonic opera of the same name written for National Portuguese Radio. As Mr Cassuto says, this prelude is something of "an independent symphonic poem". The music is on the tragic side of reflective - a sort of match for the first two Essays by Samuel Barber - as is the Symphonic Prelude. Otherwise we are very much back to the style of the first four symphonies. The next four short pieces - written in the mid-1950s - are from the same stable. These are mostly uncomplicated and green pastoral charmers. Cassuto points out "that the first three works as well as the Piano Concerto were written for a large orchestra with full-bodied string sections, while the remaining four works are all short and composed for a reduced ensemble, without heavy brass or percussion, and quite naturally with a smaller string section in mind, although this is not specifically indicated. These four ‘miniatures’, or ‘vignettes’ as I call them, are based on four different Portuguese folk songs." Of the concertos written by Braga Santos the Piano Concerto is the last and is deeply steeped in the same challenges as other late works of his including the last two symphonies plus the Three Symphonic Sketches, the Cello Concerto and the Concerto for Strings. Previously unrecorded, the Piano Concerto comprises three five-minute movements: I. Allegro vivace; II. Largo; III. Allegro moderato. The first of these sprays smithereens of notes left, right and centre. The pianist must have revelled in the Lisztian bravura but the style is flamboyantly brusque and spares the listener no rough edges. The dank and plangent tendrils of the Largo recall the central movement of Constant Lambert's mature Piano Concerto. The finale has jazzy Latin-American flavour - a sort of Milhaud meets Gershwin. There are some sweeping figures for the strings to sweeten the mix. This work should appeal to those who enjoy Shostakovich's First Piano Concerto and the piano concertos by Prokofiev but be prepared to accommodate a splash of dissonance. The collection is more than merely shored up by one of the very best of liner-notes. These are by conductor Cassuto - something of a kingpin in the revival of Portuguese music of this era. He was also the composer's friend. We could hardly be in better hands, although I am sure that other conductors will find much to draw them close among Braga Santos's output. The wholesome, lively and apt sound captured for the present Naxos disc is the handiwork of Andrew Walton and Mike Clements. This CD is for those already well attuned to the world of Braga Santos and who are, in the case of some of the music, accepting of his later enriched dissonance.